environment | Strike of Lightning! WASHINGTON, March 9. – The solar storm is affecting the Earth and it intensified on Friday causing some interference in communications before forwarding, as experts warn of more to come. The solar storm was intense, but remained low during geoefectividad on Thursday as the orientation of the planet’s magnetic field, said Eduardo Araujo, a scientist at the National Oceanic and Atmospheric Administration (NOAA). However, this Friday, “by reversing the vertical component of interplanetary magnetic field, the event geoefectividad increased significantly, and the magnetic storm reached severe levels (G3),” an escalation of five. The increased intensity has caused “extensive blockages in high radio frequency” and an increase in the margin of error of positioning systems (GPS) and Northern Lights have been seen in Seattle (Washington) and Sheridan (Wyoming ), in America, but have not reported problems with power grids, he said. The sun goes through regular cycles of activity and every 11 years or so there is a peak in activity in the storms that often occur at times distorted and even cross the Earth’s magnetic field. In fact, the U.S. space agency NASA, has recorded another coronal mass ejection is expected to hit Earth on March 11 and, according to the expert, “predicted a magnetic storm of similar intensity to which we are experiencing now “. The event is probably the strongest in nearly six years, said Joseph Kunches, a specialist in U.S. space weatherWASHINGTON, March 7. 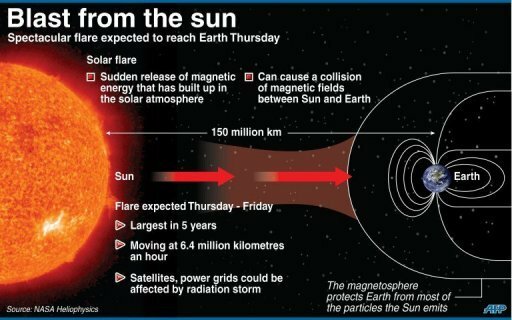 – A geomagnetic storm is moving from the Sun to the Earth, and its arrival is scheduled for Thursday which could affect power grids, roads and aircraft navigation systems, space satellite, U.S. experts said.The storm, a cloud of charged particles ejected from the Sun to about 7.2 million miles per hour, had its origin in a pair of solar flares, scientists said. 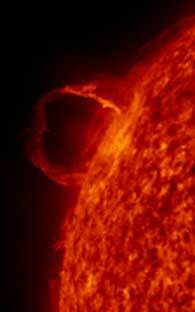 Firstly, two solar flares that were traveling near the speed of light reached Earth on Tuesday night. These flares can cause radio blackouts. Subsequently, solar radiation reach the Earth’s magnetic field on Wednesday, causing a potential impact on air traffic, especially near the poles, satellites and any astronaut who perform spacewalks. This phase can last several days. Finally, it is expected that the plasma cloud sent by the coronal mass ejection, which is basically a large part of the Sun’s atmosphere, comes to Earth early Thursday. This phase can affect power grids, satellites, pipelines and high-precision GPS systems, used by oil drillers, surveyors and some agricultural operations, scientists said. WASHINGTON, March 5. – A powerful flash in the sun’s surface, stirred by periodic storm season, sent waves of plasma and charged particles reach Earth, said the Space Climate Prediction Center (SWPC, for its acronym in English). The SWPC, operated by the National Weather Service said the flash X1.1 class, the most powerful solar flare, occurred at 04.13 GMT on Monday. It is expected that the shock wave plasma and solar particles reach the Earth in two or three days and possibly increase the Northern Lights. Solar flares affect the Earth’s magnetic field and whose waves have forced move some commercial aircraft flying over the poles whose path will continue to intensify, experts say. The sun goes through regular cycles of activity and every 11 years or so the activity intensifies and storms occur sometimes deform and even cross the Earth’s magnetic field. Experts have noted that the current storm season is the strongest recorded since September 2005 and, that causes unique visual effects like the aurora borealis, also it affects aircraft.communications and other. This also implies the electricity transmission networks, radio communications and satellite systems, although NASA has said that the astronauts on the International Space Station (ISS) are not compromised. In January, scientists detected two flashes in the course of four days followed by shock waves of billions of tons of plasma traveling at about 8 million miles per hour. Wave caused by the second of the two flashes reached Earth about 34 hours after the flash, instead of two or more days that usually takes for this displacement.